Looking out for a pillow that lets you have a good night sleep? Here is one of the best solution we’ve found for you. Coop Home Goods Foam pillow is a memory foam type pillow with a unique difference that allows you to remove some of the shredding from it and adjust it according to your need. It’s breathable as well as sturdy. The zip off is machine washable along with the whole foam inside it. It is a super soft pillow with a cover made up of bamboo and polyester. It lets your body to be perfectly aligned no matter what kind of a sleeper you are. The neck remains supported, and you will not get up with any sort of strains in the morning for sure. With its standard size and price of around $60, it proves to be a great buy. Coop Home Goods Foam pillow is filled up with shredded Visco elastic memory foam. This pillow helps you to support your neck and head and reduce any kind of strain. This pillow gives you luxurious experience as it super soft and breathable. It lets you have a new adventure in your sleep hours. The outer cover is removable and it is a mix of rayon and viscose from bamboo and polyester which provides it an opulent texture. We spend most of our time at home on our bed relaxing our head on a pillow. So, let’s just find out why we should go for Coop Home Goods Foam pillow. What makes the Coop Home Goods Foam pillow so unique? So, what makes the coop home memory pillow so special? But before getting into deeper, let’s find out the key features. 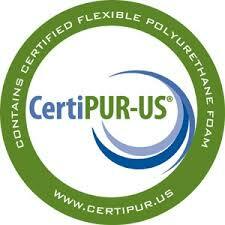 Coop Home has made a great effort to make sure that no harmful materials are used in the making of this pillow. Let’s have a look at the materials that are used by the company. As compared to the other pillows, this one makes use of cooling gel-infused memory foam and gives a fresh feeling each time you keep your head upon it. This foam even helps to enhance the breathability of the particles present in the pillow, allowing the air to pass and making you feel cool. The bamboo cover provided to the pillow helps it to retain its shape better. At the same time, it can be molded as per the comfort of the sleeper. The polyester combination along with bamboo makes it easily washable in the machine. Unlike other foam pillows that tend to be compressed with time, Coop pillow lets you remain afloat. The invisible zipper hides away as soon as you zip off the pillow, not letting you bother if someone might see it. The pillow has been stuffed in such a manner that a sleeper can easily adjust it according to his preference. Some prefer a smaller size in pillow whereas others prefer a bigger one. So, it is adjustable such that each one can fill it or remove the excessive filling within it according to their own need. There are several pillow companies out there who merely focus on the outside design and use cheap quality of filling material. 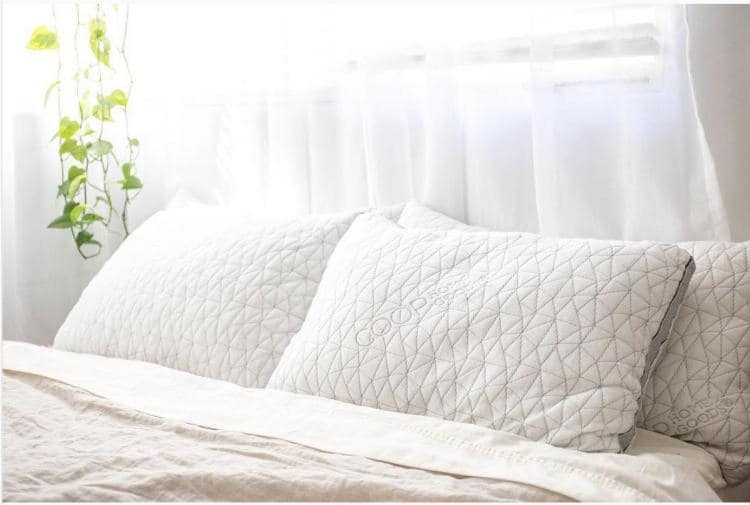 On the other hand, Coop home goods use brand new memory foam fill for the pillows which are certified and tested by CertiPUR-US® and GREENGUARD Gold to ensure safety and quality. 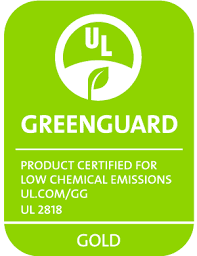 Pillow material is free from mercury, ozone depleters, CFC, CPSC, lead, TCEP flame retardants, TDCPP, heavy metals, formaldehyde, etc. This is one of the interesting features of this pillow. Like most of the consumers, you may also want to try a product before deciding to continue or not. Coop home provides you an astonishing 100 days trial with full refund along with covering the return shipping. Along with five years warranty and 100 nights trial, this is one of the best return policy that we have observed in the pillow market. Coop home goods are so sure about their product that they firmly believe that you will never need to return this product and you are guaranteed to have a warm and cozy sleep experience. 100 Days trial – You get a 100 days trial period during which you can well decide that is this pillow worth to be your sleep partner or not. Five-year warranty – The pillow even comes with a five-year warranty. Let’s discuss some of the features of this pillow which makes it stand out among the various pillows in the market. Breathable in and out – The cross-cut pattern of this pillow makes it breathable in and out. The outer covering allows an edge to edge distribution across the pillow letting you adjust it according to your need without worrying about any sort of clumping. Machine Washable – The most amazing part that makes this pillow stand out from the rest is that it is machine washable. The cover and the filling can also be separated and washed in the machine separately. One of the few offering a zipper cover – This pillow is one of the very few that provide a zipper cover that can be opened up anytime in order to make it work according to your needs and moods. 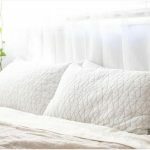 Shape your pillow the way you want – You just need to grab your pillow, fluff it at the sides or in the middle depending upon the space you need to delve your head into. So you can just pick it up and shape it the way you want. Highly versatile – It is highly versatile with its variable qualities and features. It gives its users ample of opportunities to customize it according to his/her preference. Different kinds of sleepers have different needs. They seek for a variety of features in their pillow depending upon sleeping position needs. For a Stomach sleeper – A stomach sleeper usually seeks for something really low that does not stress his back when he is sleeping. So, this pillow would be an excellent choice for them. For a Back sleeper – A back sleeper usually looks for something ranging between low to medium. This acts as a thinner pillow for such sleepers to help them align their body the way they wish to. For a Side sleeper – A side sleeper asks for something medium to high that positions in between the head and neck providing a convenient alignment for him too. Coop home goods shredded pillows are competitively priced and their price hovers around $60 for queen size and around $65 for king size. But if you are lucky you can get a discounted rate as well. 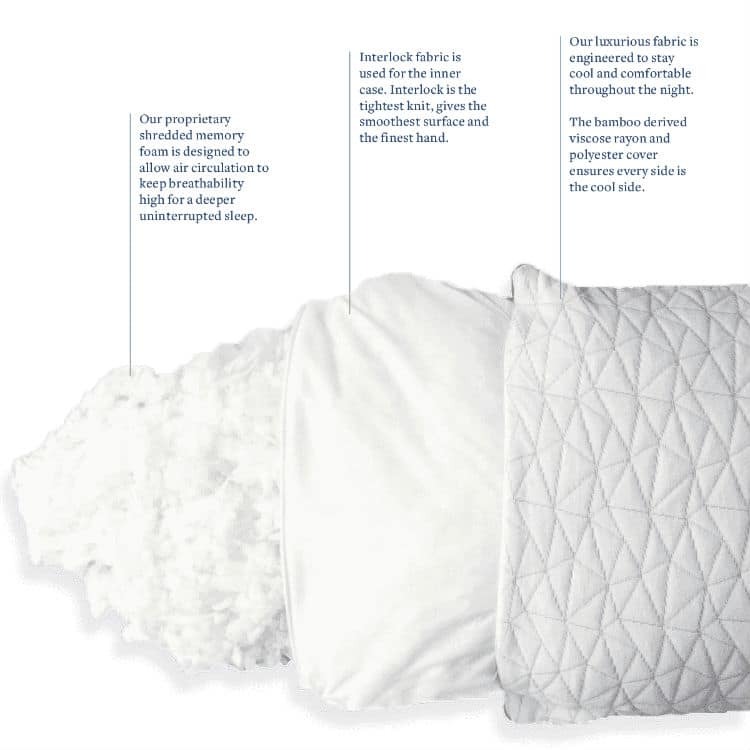 The research team at Stemjar does not find any convincing cons with this one of the best in the class pillow. But we have found some reviewers complaining about the following. Removing and reinserting the foam can be a tedious task at times. It gets pretty much difficult to analyze what level of filling would suit you best. It might seem to be a little expensive for the people who are seeking for cheaper pillows. Though it has many good features, it might not fall into the reach of every person. Initially, the pillow possesses a pungent kind of smell which makes it tough to be used until it not exposed to air for some time. But, with more than 15000 five-star reviews, you may not like to doubt this product. To sum up, this pillow is a great buy. If you are looking for thicker support along with a soft texture, Coop home goods pillow would be a great choice. With its feature of easy cleaning, it becomes, even more, customer friendly and hygienic. Its 100 days trial and five years warranty add to its qualities. It’s hypoallergenic and dust mite resistant and it has all those qualities that would make it as the pillow of dreams. After earning a rating of 4.3 stars out of 5 on Amazon from around 15,940 customers, this pillow sets itself to be a unique product in the sleep market goods. It is a must buy if you are a person who loves to enjoys a good sleep. PreviousWhy are Your Teeth Sensitive to Sugar? 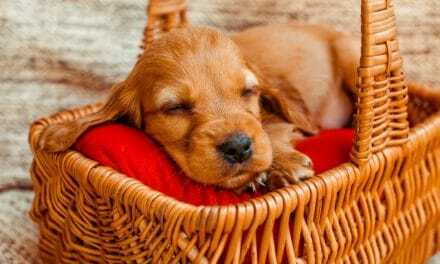 The Best Sleeping Position – What Does It Say About Your Personality?